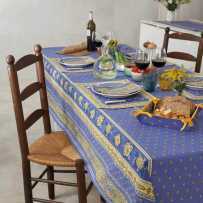 Bastide placemats are products of the Marat d'Avignon brand, an old and traditional textile house. Bastide is one of the most typical prints of Provence, with a repetition of floral motifs in strips, alternated with "calissons". The finishes are neat with a very soft touch cotton. The quilted technique gives a very nice thickness to protect a table while dining. The careful confection confers a higher quality to these placemats in boutis style. Both colors highlight the blue. The first one is close to lavender blue, embellished with this very provencal gold yellow as final edging. The second is rather dark navy, counterbalanced by light gray. We offer a wide range of items from this delightful collection of tableware and kitchenware. 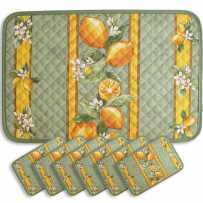 In particular, several models of padded table mats, framed, rectangular or octagonal. 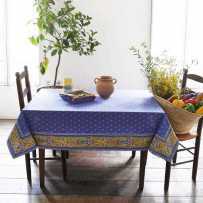 Coordinates of various tablecloths, with possible coating, table mats are present in the categories concerned. To complete your assortments, some items are useful in the kitchen as gloves and pot holders, and aprons. You will find different matched napkins with the same colors and two options: allover (calissons), or "stripe", that is to say with the floral strips. For a dinner with Provencal elegance, alternate allover and stripe patterns for accessories: this will lighten the visual effect. 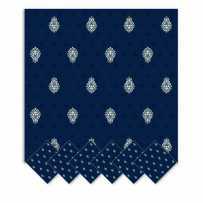 These rectangular placemats are especially recommended for everyday use, even in the kitchen. They are simple in shape and easy to maintain.